Home » International » First ever memorial to African and Caribbean Service Personnel unveiled in Brixton. First ever memorial to African and Caribbean Service Personnel unveiled in Brixton. The first ever memorial honouring the contribution of service personnel of African and Caribbean origin in both World Wars has been unveiled in London. The memorial was unveiled at Windrush Sq, Brixton honouring the contribution of Service personnel of African and Caribbean origin in both World Wars. Unveiling of the African and Caribbean War Memorial in Windrush Square, Brixton. 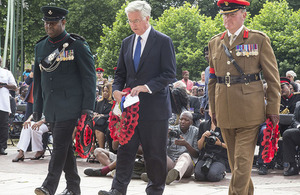 The Secretary of State for Defence Sir Michael Fallon laid a wreath along with other dignitaries. The ceremony also included music from the Parachute Regiment Band and traditional African music and dance and a parade of Service personnel, veterans and cadets. Today (22nd June 2017) the first ever memorial to African and Caribbean servicemen and women was unveiled in a ceremony attended by Defence Secretary Michael Fallon and Mayor of London Sadiq Khan. The UK is indebted to all those servicemen and women from Africa and the Caribbean who volunteered to serve with Britain during the First and Second World Wars. It is thanks to their bravery and sacrifice that we are able to enjoy our freedoms today. We should also congratulate those who have worked tirelessly to place this memorial in >the heart of Brixton. The brave men and women commemorated today came from all walks of life but were bound together by their immense courage and determination. Serving thousands of miles from home, they fought and fell with British soldiers to defend the freedoms we enjoy today, despite the majority never having visited this country. We owe them all a tremendous debt of gratitude for their sacrifice and for the substantial contributions so many >veterans have made to enrich British life. The Government has supported the monument by providing £80,000 worth of funding through the Department of Communities and Local Government. Black Britons volunteered at recruitment centres to serve in the Army and Navy soon after Britain joined the First World War in August 1914. As the war pulled in volunteers from all four corners of the world, they were soon joined by volunteers from the Caribbean, many of whom paid for their own passage to fight for the “Mother Country”. The West Indies not only contributed men to the war effort but people from the islands made significant donations despite significant economic hardship. The British West Indies Regiment was enacted by Army Order in 1916, with the first battalion formed in Seaford, East Sussex. By the end of the war 11 battalions comprising over 15,000 soldiers – 66 % of whom came from Jamaica – had seen action, particularly in Palestine and Jordan. However, many men also fought in the European battlefields of France, Belgium and Italy, as well as in Egypt, Mesopotamia (Iraq) and East Africa. Altogether 2,500 were killed or wounded. During the war servicemen from the unit received 81 medals for bravery, with 49 servicemen were mentioned in despatches. 55,000 men from Africa were recruited for military service and hundreds of thousands of others carried out vital roles, fundamental to sustaining the war effort as carriers or auxiliaries as part of the Labour Corps. They came from Nigeria, the Gambia, Rhodesia (now Zimbabwe), South Africa, Sierra Leone, Uganda, Nyasaland (now Malawi), Kenya and the Gold Coast (now Ghana). While African troops did not see active service on the battlefields of Europe, they did fight in the Middle East and on the African continent. It is estimated that 10,000 Africans were killed with 166 receiving awards for bravery. More than 2 million African and Caribbean Military Servicemen and Servicewomen’s participated in WWI and WWII but have not been recognized for their contribution. The unveiling of this memorial is to correct this historical omission and to ensure young people of African and Caribbean descent are aware of the valuable input their forefathers had in the two world wars. During the Second World War, forces from the British Commonwealth of Nations were active in all the major theatres of war. Some 16,000 men and women from the Caribbean left their families and homes to volunteer for the British Armed Forces. Around 6,000 served with the Royal Air Force and the Royal Canadian Air Force working as fighter pilots, technicians, air gunners and ground staff. In addition thousands of West Indian seamen also served in the Merchant Navy, transporting cargo and people. This proved to be one of the most dangerous services during the Second World War with almost one third of all merchant seamen dying at sea. West Indian women also served in Britain with the Women’s Auxiliary Air Force (WAAF) and the Auxiliary Territorial Service (ATS), with 80 choosing to serve in the WAAF while around 30 joined the ATS. 236 Caribbean volunteers were killed or reported missing during the Second World War, 265 were wounded. Caribbean air force personnel received 103 awards for bravery. The histories of World Wars often overlook the significant contributions made by African and Caribbean soldiers. However, today we can proudly mark the recognition of their bravery and sacrifice to the struggles of independence. As the national heritage centre dedicated to the preservation of Black history, we will continue to tell the stories of their service and to ensure their contributions and the legacy of this historical narrative becomes part of a more inclusive British history, and remains accessible to all through our archive collection. June 22 is Windrush Day which marks the anniversary of the arrival into Tilbury Docks, Essex of the MV Empire Windrush and the first wave of post-war immigration, 69 years ago. The memorial was devised by the Nubian Jak Community Trust (NJCT). The Trust runs a commemorative plaque and sculpture scheme to highlight the historic contributions of Black and minority ethnic people in Britain and has led the three year campaign to honour servicemen and women from the First and Second World Wars. The memorial comprises two obelisks in Scottish whinstone, resting on a 12 foot pyramid shaped plinth of Ancaster Limestone, weighing just over 5 tonnes.